Semrock’s industry leading laser dichroic beamsplitters just got flatter. We’re setting a new standard for Super-resolution / TIRF microscopy with λ/5 P-V RWE on our new 3 mm thick dichroics and 1λ P-V RWE on our improved 1 mm dichroics. Each one comes with our Semrock guaranteed steepest edges, short wavelength reflectivity down to 350 nm, and long wavelength transmission optimized out to 1200 nm or 1600 nm. Super-resolution & TIRF imaging systems are highly sensitive to optical wavefront distortion and demand the highest quality components. In order to address the needs of this market, Semrock has introduced industry leading laser dichroic beamsplitters with λ/5 RWE to minimize the reflected wavefront distortion, thereby maximizing both the signal and the signal-to-noise ratio in super-resolution microscopes. For setups in which maximizing the switching speed or minimizing the beam shift in transmission is critical, Semrock’s 1 mm thick laser dichroic beamsplitters have been significantly improved to 1λ RWE (~255 m radius of curvature). These industry leading optics are compatible with popular microscopy filter cubes and improve the performance of laser based confocal and TIRF illumination systems. They are also ideal for reflection of imaging beams in conventional structured-illumination techniques as well as patterned illumination systems for localized photo-activation. These dichroic beamsplitters allow the use of much larger diameter illumination beams, offering researchers and instrument developers more flexibility in system design with no compromise to overall performance. 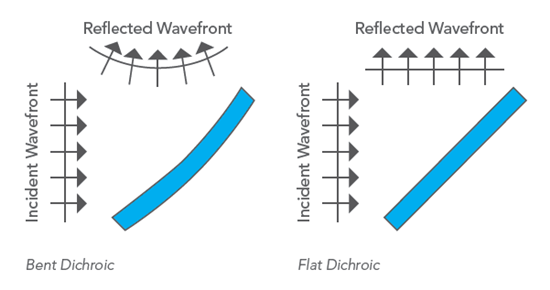 For more detailed background and information, please review our Tech Notes titled "BrightLine® Laser Dichroic Beamsplitters” & "Practical Flatness”. Semrock Flatness/ RWE Classifications and recommendaed dichroic family information along with manximum allowable beam diameter values. More detailed information is found in the Semrock Whitepaper. Maximizing the Performance of Advanced Microscopes by Controlling Wavefront Error Using Optical Filters. Filter sets with guaranteed 1λ P-V RWE from cube mounted 1mm thick dichroic beamsplitters are available.